Giant George wasn’t always so giant. In fact, back in November 2005, he was the runt of the litter – a far cry from how large he eventually grew. But he ended up growing – and growing, until now he’s 43in tall, giving him the title as world’s tallest dog by 3/4ths of an inch. He’s not only the tallest dog currently – he’s the tallest dog of all time. On February 15th, 2010, it all became official when the Guinness Book of World Records awarded Giant George the record, and on February 22, 2010 it was announced on the Oprah Winfrey show. Since then, there has been much media attention for Giant George. Giant George’s owner, Dave Nasser, has written a book, Giant George: Life with the World’s Biggest Dog. Giant George has been on numerous TV shows and has done many interviews. Through it all the Great Dane has taken his celebrity status in stride. Given he’s such a big dog, Giant George has quite the appetite and loves dog toys. At 245 pounds, he needs a lot of food, and he certainly eats a lot – 110-130 pounds of food per month, costing from $250 to $300. Much of this food is a combination of dry dog food and roasted chicken. His weight makes him around 100 heavier more than the average Great Dane. When he’s not eating, he’s often found on the golf course – riding in the golf cart, a favorite activity. He also has is own queen-sized bed to sleep in – and given his height, he needs the large space to relax and sleep. Giant George also has a large following online. He has over 125,000 likes on facebook and over 2,500 followers on twitter – with both numbers growing consistently. People love reading about him, following his activities and keeping in touch. He’s really struck an emotional chord with people across the world – everyone loves Giant George and welcomes his story into their lives. Physically he’s the tallest dog ever, no doubt, but he’s transcended that to really carve out a place in the lives and hearts of millions. If there are any large dogs that are well known in the world, Zorba is probably one of them. Zorba is an English Mastiff from the UK that made the Guinness Book of World Records because of his massive size. 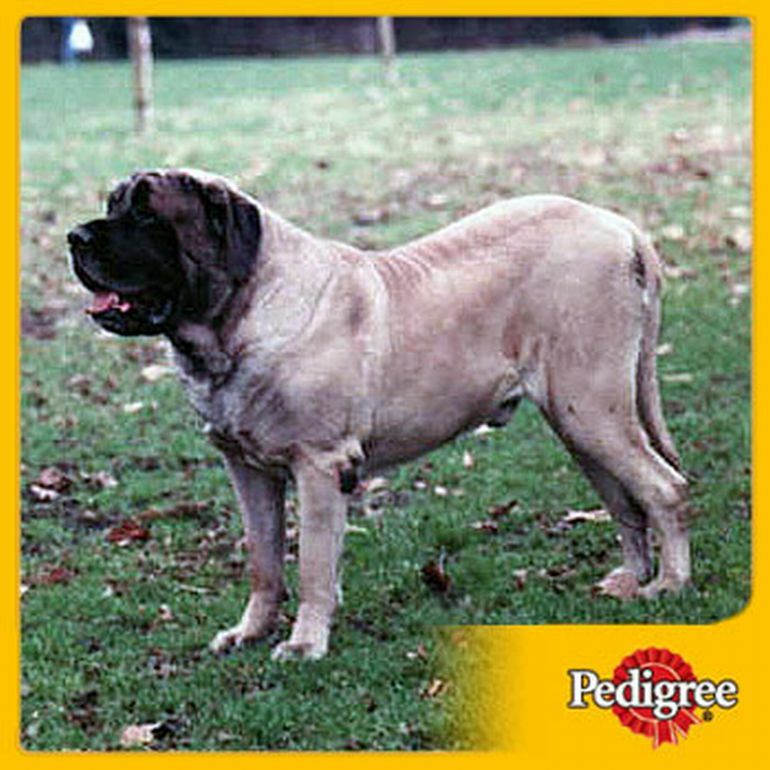 The English Mastiff is a large breed with an excellent reputation from those who know of them. 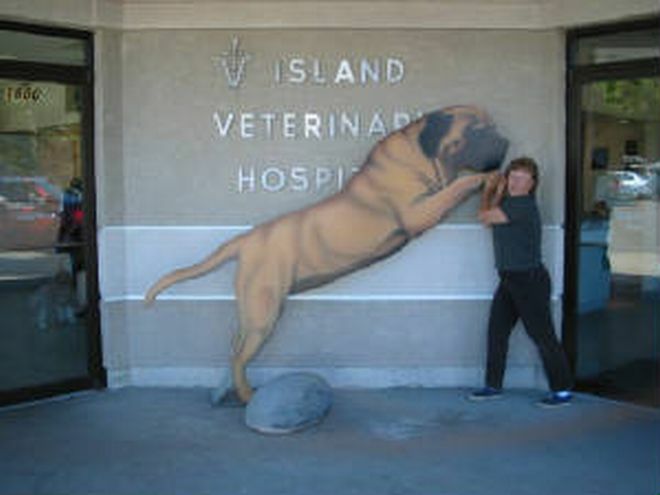 Many people are not familiar with the Mastiff breed, until they read about one of them being in the Guinness Book of World Records. Zorba holds the all time Guinness World Record for the largest dog ever at 343 lb (156 kg). He was also measured from nose to tip of the tail at 8 feet and 3 inches (251 cm) and 37 inches at the shoulder. He was 8 years old at the time of the measurements, which was November, 1989. He always had great courage and dignity. He was are good natured, calm, easy going and had a great sense of humor. Adults loved him and he was great with children. Don’t forget to check out the Tallest Dog in the World too. They do not show a lot of affection openly, but they are very loyal and devoted to the entire family. Unlike some breeds that are “one man dog” that are loyal to one or two members of the family; the Mastiff seems to know who the family members are and are loyal to the whole family. They are protective of the family, especially with strangers. If a stranger comes to their home, often the Mastiff will place itself between his family and the stranger. They stay that way until their master gives some indication is the visitor is a friend or not. With their massive size, (many are WAY over 200 pounds), there aren’t very many people that would want to cross the boundary line without them allowing it.